Hiroko picked her way slowly through the Aokigahara forest. Go deeper, she told herself. Move quickly. You must not be found. But quick travel was impossible as the trees grew thickly here. Cypress, red pine, oak and others all conspired to block her way. She should have stayed on the pathways. Already her special kimono was torn and dirty. She had hoped to die dignified, with honor. She should have known better. Death is not neat. Mist weaved through the trees as the morning sun cast countless spears to the forest floor. The whispering of leaves and the scampering of small animals were the only sounds other than Hiroko’s labored breath. The air smelled of moist earth and vegetation. It is beautiful, Hiroko thought, here in the Sea of Trees. But the beautywas deceptive. Hundreds of people came here each year from across the country to end their lives. It was called the forest of death for a reason. Their ancestors used to abandon the sick and old here. It is best this way, Hiroko thought. I am an old woman. Her daughter Suni was right about that. Hiroko was no longer useful. Why couldn’t Suni see that? Hiroko would still be a burden to her in a rest-home. Out here in the forest, among the spirits of her ancestors, she would be welcomed home. Her hand wandered down to the small purse tied to her waist and she felt the package inside. The sun is high in the sky. Suni searches for me by now. It is time. She untied the bundle from around her waist, glad to be free of its encumbrance. She spread out the small blanket that had been her grandmother’s and sat upon it, her legs folded neatly underneath her. Then she opened the package. The pills were tiny and innocent, like little candies. They crowded together in her palm. A death prayer echoed in her mind: “Your fear of death is but the trembling of the shepherd when he stands before the king.” She thought of the ancient Samurai. To die with dignity was important. Why couldn’t Suni see that? She placed a pill in her mouth and swallowed it with a sip of water. Then another, and another. Soon she could feel an odd lightness in her head. She must hurry and finish them all. Her hand trembled so that several of the precious pills tumbled to the forest floor, instantly lost among the dead leaves. She gasped, but then calmed herself. Enough still remained. She took another, swallowed it with water. She had only a little water left. Not enough. Her head spun and her stomach churned. The sounds of spirits taunted her, calling her name. Quickly, she thought, I must swallow the rest before I am unable. She reached for another pill. “You must stop this,” said a small high-pitched voice. It laughed. “Quiet, spirit!” said Hiroko. She fumbled for another pill. They tumbled out of her hand. Oh, no! Hiroko tried to focus. Why wouldn’t this yurei leave her alone? She was so tired. It took all her strength to turn around. She struggled to see clearly. It could not be! A tree stood before her—a slender tree with long smooth branches heavily laden with strange fleshy fruit. To her amazement, each piece of fruit had a face. Filled with doubt as she was, still Hiroko could not deny the obvious. It was Jinmenju, the legendary Laughing Tree. As a little girl, Hiroko had spent hours in her Grandmother’s bedroom as the old woman entertained her with stories. She learned of Mu-Onna, the Nothing Woman—a demon who would steal the souls of small children—or Yatagarasu, the three-legged crow that prophesied good fortune to whomever saw it. Ever since, Hiroko had looked at the legs of every crow she ever saw, hoping to see Yatagarasu. Sadly, it never appeared. Then there was Jubokko, the Vampire Trees that grew on battlefield sites or wherever people had been killed. Hiroko had been so spooked by the story that for years she stayed away from any dead trees or any trees that stood alone. 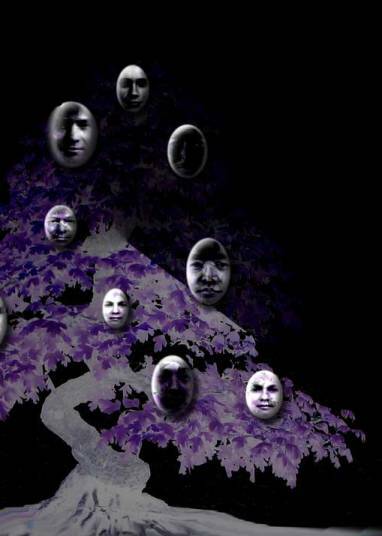 Hiroko’s favorite story, however, had always been about Jinmenju, the laughing trees. They grew long ago in the high valleys. There was a time, her grandmother had said, when the sound of their laughter echoed throughout Japan. Sadly, they were now extinct. Or so everyone had thought! Hiroko looked at the tree in amazement, particularly at one piece of fruit which seemed to grin at her. “You make fun of me?” Hiroko fumed. She felt so strange, so airy and buoyant. Everything around her glowed with an odd brightness. “To me, all things are funny. Ha-ha-ha,” it laughed again, only this time many of the other fruit on the tree laughed with it. The chorus of laughter was too much for Hiroko to resist and she found herself laughing along with them. They were so cute! Like little babies. Once she started laughing, Hiroko found she could not stop. Every thought brought amusement. What would Suni think if she saw her now, talking to a tree? She laughed harder. She hadn’t laughed like that since she was a child. She felt embarrassed and was glad no one else was around to see her giggling so. “Do you still wish to die?” asked Jinmenju. Hiroko’s mouth fell open. She did not wish to die. Now it seemed a foolish thing. She felt almost as if something had possessed her and brought her here and finally it was gone. It was the forest, she realized—the Sea of Trees. It looked beautiful, yes, but there was an awful darkness here. “Jubokko!” the tree hissed, and all its branches shook. The fruits laughed, but quietly and not in mirth. “The vampire tree?” Hiroko asked, shivering with fear. She spun around, looking at the various trees. “You need my help?” Hiroko asked. She felt a surge of joy. Yes, she was an old woman, but she could be of help. She could be useful. “You will help me?” Jinmenju asked, smiling widely. Hiroko saw that all the fruits were staring at her and smiling. “Ha-ha-ha!” The entire tree broke into screaming laughter and at once the fruits began dropping to the ground. Hiroko jumped up and gathered them quickly placing them all in her mother’s blanket, which she tied into a sack to carry them. She had exerted herself and laughed so hard that she now felt tired and dizzy. She clung to one of the branches of the laughing tree to steady herself. If she could just reach that one last piece. But she didn’t have the strength. Why do I feel so strange? Where has my energy gone? A wave of dizziness swept over her. She looked over and saw a crow pecking at the last piece of fruit. “Get away crow!” Then she saw: it had three legs. It had finally appeared to her. Yatagarasu! Her head spun. I must sit, she thought. Darkness swam before her eyes and she saw the ground coming towards her, then nothing. When she awoke, it seemed as though only moments had passed. She struggled to orient herself. A bright light shone down upon her, hurting her eyes. Was it the sun? She blinked and tried to sit up. “She’s awake,” said a voice. It was Suni. She fell heavily upon Hiroko and hugged her tightly. I am in a bed, Hiroko realized with surprise. “Where am I?” asked Hiroko. An antiseptic smell stung her nostrils. Hiroko kept her mouth shut. What could she say that didn’t sound crazy? You have more power than you know, she thought of Jinmenju’s words. But Hiroko soon realized that she had no power to stop herself from being placed into the rest home. Suni and the doctors dismissed her pleas as the ravings of someone who was no longer of right mind. And perhaps they were right. What she remembered now seemed so fantastic. She kept silent. Her daughter acted quickly. Hiroko was moved directly from the hospital to the rest home. She was not given the chance to visit her home and gather her things. The rest home was all that Suni promised. They fed her, they bathed her, they patted her hands and heard her complaints. But they did not listen to her. All Hiroko could think of was how she failed Jinmenju and she wept. She had failed Jinmenju. The Jubokko would take over the Sea of Trees and many more would die. Suni cleared out her mother’s old room, discarding some things and saving others. Yes, she felt sad that her mother was in a rest home, but it was best for all involved. Her mother needed twenty-four hour care and Suni no longer had the time or the energy. It was for the best. Still Suni felt sad as she emptied out Hiroko’s room. She would miss her mother—even her crazy ramblings about spirits. Oh, how Hiroko used to scare her with stories about the Nothing Woman. Suni had been afraid to go outside at night for years. It had taken Suni her entire life to separate the truth from the fiction of what Hiroko had taught her about the world. Suni felt tears coming. Yes, her mother was a little strange, but she was a good woman. What’s this? Suni asked herself, as she pulled a sack full of lumpy objects from the corner. She recognized the blanket. It was her great grandmother’s, passed down from daughter to daughter. Why had her mother tied it like this? And what was that smell? A sickly sweet odor, like rotting apples wafted upwards. She opened the blanket and was surprised to see a pile of little tan-colored fruits. Their skin was wrinkled and some of them had begun to turn. What kind of fruit is this?. And why has my mother put them in here? She lifted one up, sniffed it, then almost dropped it. It had a strange puckered little face on it! The face was complete with tiny button eyes, a small protuberance of a nose and a fleshy-lipped mouth. It looked spookily human. She picked up one that appeared to be ripe and good. She took a small nibble and instantly spat it out. The fruit was too sour and full of large seeds. Her mother must have picked this up in the forest, she realized. She was not in her right mind. She was hungry and would have eaten anything, even this strange wild fruit. Suni put the fruit in a bag and walked out into the backyard. There it was, the Sea of Trees. How she hated the forest beyond the fence—the forest which had almost taken her mother’s life. She had never liked living so close to it. Now she despised it. One by one, she threw the rotting fruit over the fence and deep into the forest. Take that, she thought, as she tossed the fruit. It felt good to release her anger. She threw them all and then returned inside to continue cleaning. And deep in the forest, a small tree with a single piece of fruit clinging to one of its branches shivered and knew that its children had finally found a home. And it laughed and laughed.